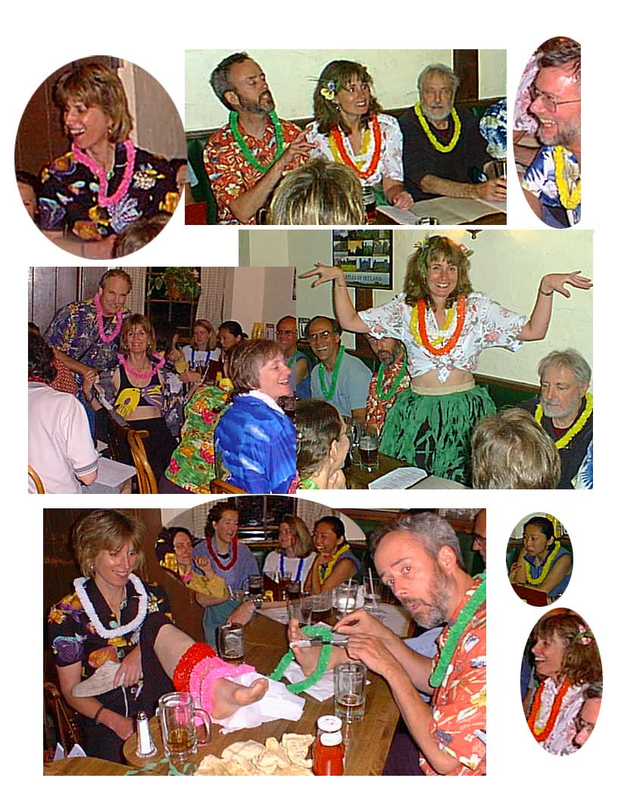 A long time ago when I started climbing in the early 90s, there was a longstanding ritual on Wednesday nights. Sometimes when I look back to those early days I feel very old and mummified. Things in general have changed a lot in 24 years. So let me bring you back to the good old days. 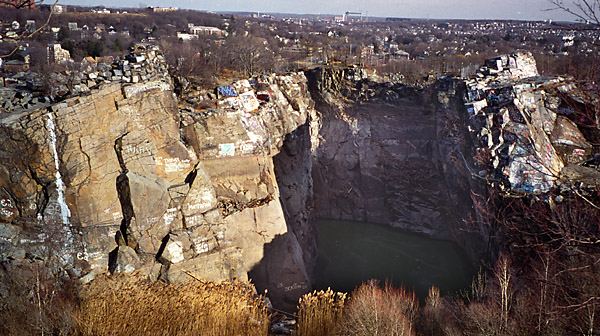 The Quincy Quarries was, for many, the place where they first touched rock; the hallowed grounds if you will. The majority of people who took the annual Rock Program had never climbed before prior to those early spring weekends. Back in the day, the only climbing gym around was the Boston Rock Gym which was originally located in Somerville and was one of the first rock gyms in New England. Only the “real climbers” went there. Lessons were not available and I don’t recall if harnesses and shoes could be rented. Bottom line was you were already a climber. You get the idea. Learning to rock climb was on real rock, period. After taking the the Rock Program, or if you were a new climber in town, the place to meet potential partners was the Quarries on Wednesday nights. There was also a Tuesday night schedule on the North Shore, but for me it was the Quarries. First, because they were more convenient and second, because the après-climbing (equally important) was more fun. Darcy’s was rocking and one didn’t leave there until several pitchers of beer had been imbibed. It was a given that Thursday morning at work you would be a bit bleary-eyed. So what happened? Times changed and rock gyms became more abundant. In fact, the prevalence of gyms today reminds me of the UK where there is a gym on practically every street corner. When they first became abundant, most of my friends and climbing partners would hit the gym at night in the fall when the evening was too short to go outside after work. Somehow these days most people rarely go outside to climb after work. The gym is the scene and while you can get more laps in, it’s just on plastic. The first guidebook was written and published informally by Will Crowther and Anthony Thompson in 1964 with a few supplements that were added over the next decade. When I started climbing at the quarries I got John Strand’s Blasted Rock Quarry Climbs which was my bible for many excursions. Back then the hard-man area was undoubtedly the Pins Wall which today is called K Wall. Pins, in the old days, was over a small body of deep water fed by an underground spring. I recall being lowered down and yelling up to my belayer to stop just before my feet touched the water or in some cases, I could stand on a small ledge. The opening moves of the climb would be sphincter-tightening because if you blew a move too soon, the stretch in the rope with combined body weight, might see you dipping into the water and getting wet feet. The bottom line was that you would only try a climb if you were sure you could somehow get up. Untying and giving up was not an option unless you wanted to swim to get out. Here too is where the prussic skills taught in the Rock Program would come in handy. More recently Boston Rocks (2nd edition) is the book to have and the various sections all go by a letter not a name. Pins is K wall and Knights Wall is now S Wall. I find it hard to direct new climbers asking directions because often times I have no idea where the letters go. 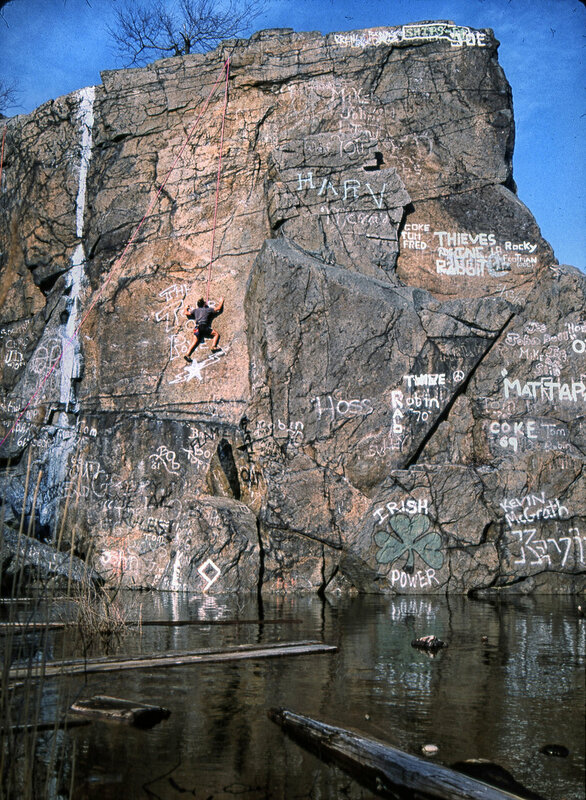 The Quarries was not only a place for climbers, it was once a proving ground for local youths who would jump on a dare into the waters that were over 200 feet deep located behind Knights Wall (S Wall). On a hot summer night, I was always envious of the jumpers who were able to cool off in the chilling depths. Sadly, over the years some jumpers were injured and a few others killed hitting debris and logs in the water below. A local once told me that those were the outsiders, kids from the area knew where to jump. Around 1997 the Quarries was the scene of a police investigation looking for a murder victim. Timing was right and the draining began. Can you believe the small pond at C-Wall was drained dry in a matter of days with the underground spring drying up as the waters near Pins were drained? The smell of dead fish and water snakes was prevalent. With the small pond at C-Wall gone, the depth exposed some good bouldering opposite C-Wall and that area remained popular for bouldering until it filled up with spring water when the quarries was filled. The Big Dig was useful in filling in the gaping hole left near Pins (K Wall). For weeks, truckloads of fill from the Big Dig, tag-teamed dumps filling in the area and opening up walls of rock now accessible for climbing. Walls M,N, Q, and P were opened up and now could be easily climbed from the ground up. Pins became less daunting. If you can’t make the move, simply lower down and untie. Let’s not forget our little quarry has been in several movies over the years, the most memorable being Gone Baby Gone. Tom Callaghan did rigging for the movie crew. So when you discard the Quarries as a “who wants to climb there” dump, try to think of all the people, who, over the years, cut their teeth there including Henry Barber who needs no introduction, our own hard-man Tom Callaghan, Barry Rugo from the successful NE Everest Expedition, just to name a few. So a few years ago I decided to go back to my roots and go outside on Wednesday nights. Some of the original crew from the old days were on deck as well. Local hard-man Tom Callaghan, who along with John Strand, had put up the many of the climbs at the quarries, often came by to get a few laps in. The Quarries has always been known for its thin face climbs and John Strand once told me “if you can climb face at the Quarries you can climb anywhere.” I have to agree with his comment. Today the climbs are made harder by layers of spray paint plastered on by graffiti “artists” as they like to be called. Gym climbers who have taken the program, fail to see past the paint to see the beautiful aesthetic lines of the various routes. The climbs have begun to look like an old silent screen siren whose face paint is melting in the heat but still the beauty is there if you look for it. If you get the urge to check out the quarries some Wednesday night when the weather allows, we’d love to have the company and don’t forget, it’s Darcy’s afterwards.